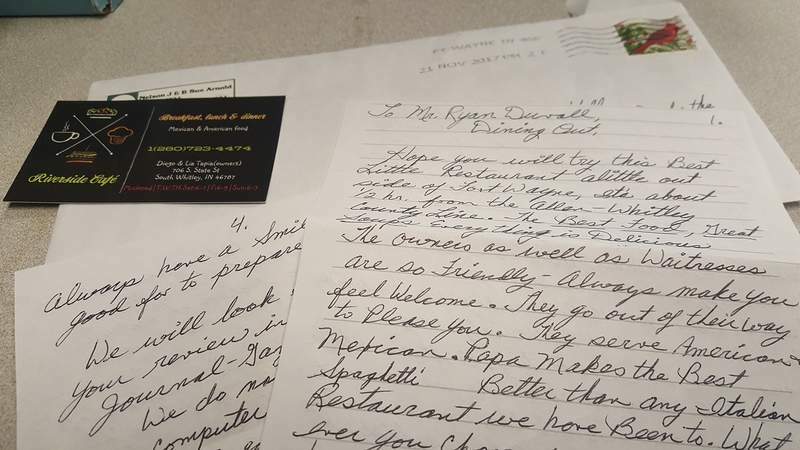 A hand-written letter touting Riverside Cafe in South Whitley. Carne Asada dinner from Riverside Cafe in South Whitley. Riverside Cafe in South Whitley. 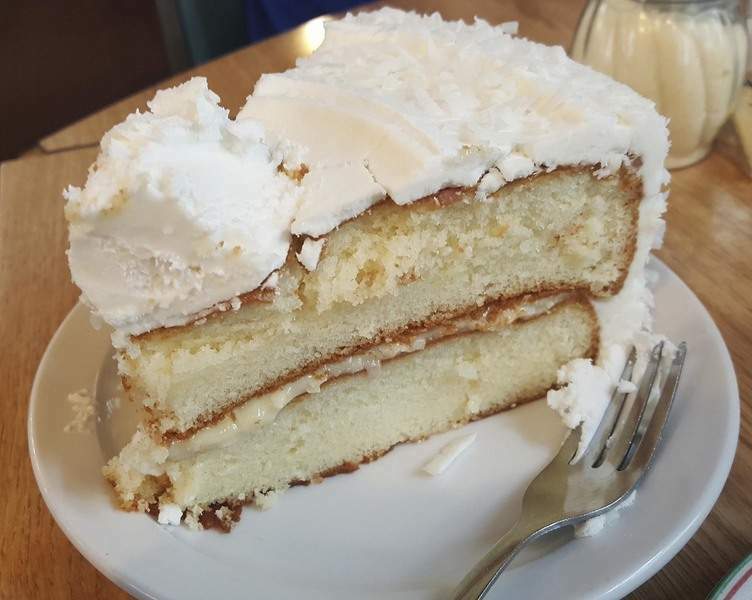 Coconut cake from Riverside Cafe in South Whitley. Spaghetti from Riverside Cafe in South Whitley. 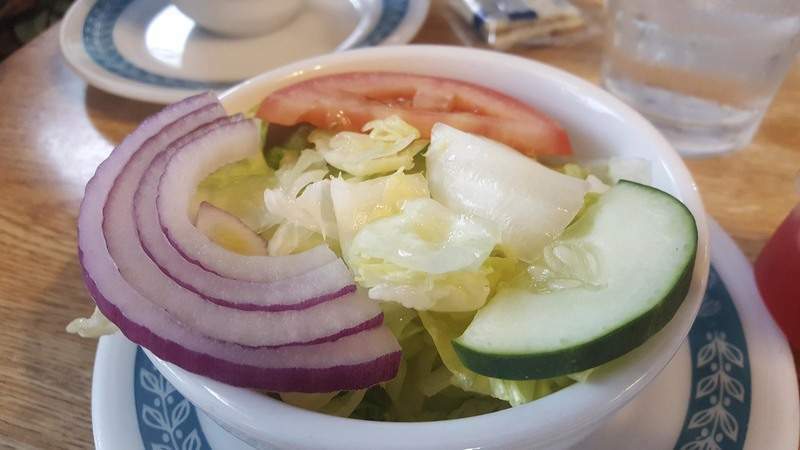 A side salad from Riverside Cafe in South Whitley. Strawberry Delight waffle from Riverside Cafe in South Whitley. Pork chop dinner from Riverside Cafe in South Whitley. 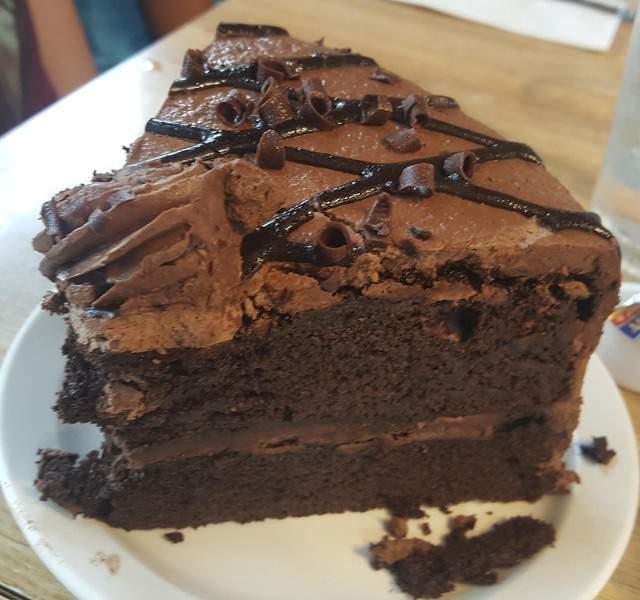 Chocolate cake from Riverside Cafe in South Whitley. 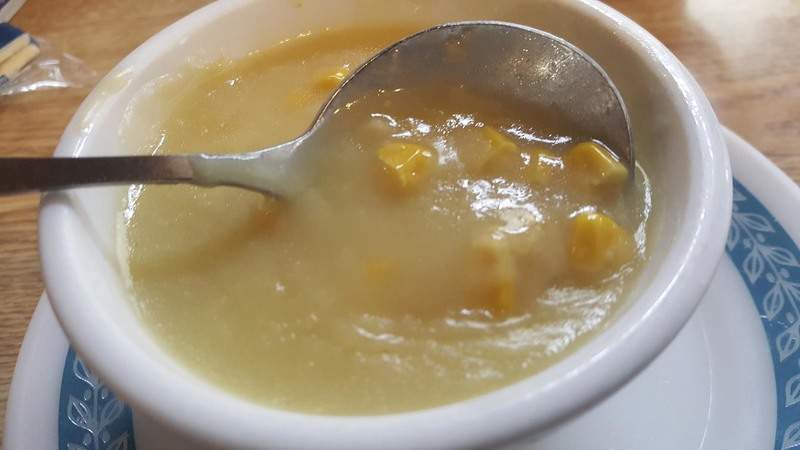 Corn chowder from Riverside Cafe in South Whitley. Riverside Nachos at Riverside Cafe in South Whitley. Grilled tilapia and shrimp with garlic sauce from Riverside Cafe in South Whitley. Fresh guacamole from Riverside Cafe in South Whitley. Suggestions come in all the time for friendly little family restaurants throughout the area, and it usually takes several affirmations from readers, especially when it comes to regional places that don't seem to be anything unique or special on the surface. 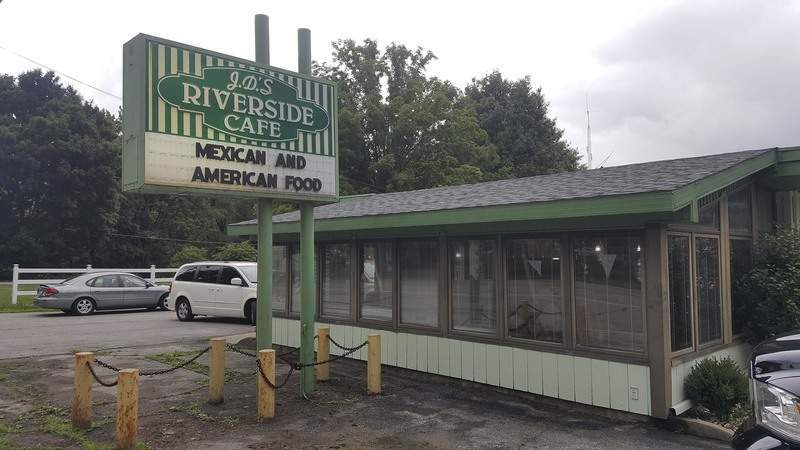 But the pitch I received touting Riverside Cafe in South Whitley was different, and I just had to check the place out. The beautifully penned, handwritten letter from Nelson and Sue Arnold of Fort Wayne was a jewel. The description from this admittedly “computer illiterate” couple about this longstanding restaurant and its owners for the past 13 years – Diego and Lia Tapia and their family – was impressive. Riverside is like a lot of other places in smaller towns in that it offers a little bit of everything. But the Tapias also offer some very good Mexican fare, and it was the highlight. Was it a place I would make a special trip to South Whitley for? Probably not. But if I lived near there, it is a place I could see myself visiting all the time. 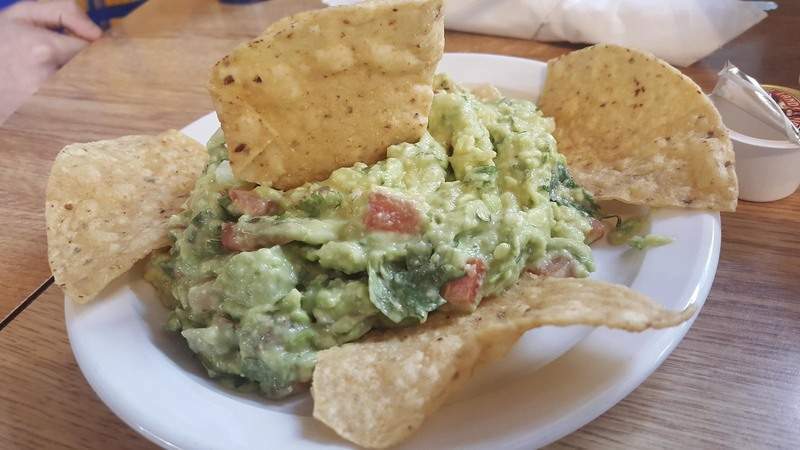 I could not pass on the freshly made guacamole as my first taste of this cozy little place that looks like it hasn't changed much since the 1970s, with its old furnishings, lattice accent pieces and plastic, accordion-style room divider. The guacamole had the perfect balance of tomato, onions and cilantro blended into its creamy, tasty avocado, and I ate every bite of it. The house salsas were decent, but the guacamole shined. And the best meal I had followed the Mexican theme. The weekend feature Carne Asada dinner was also one of the most enjoyable versions I have had recently. I received a huge slab of skirt steak that was perfectly cooked to medium rare, was about as tender as a piece of skirt can be, and it was perfectly flavored by Diego's signature seasoning blend. 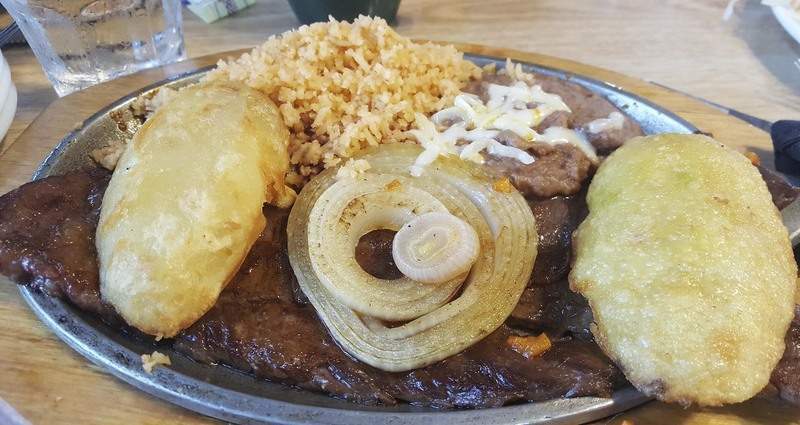 It was served on a fajita skillet and topped with sweet grilled onions, with two halves of a “steak potato” and the restaurant's respectable refried beans and rice. It was a hefty dish that also included tortillas. The potatoes were interesting – roasted, then flash-fried to be crisp on the outside – but they were almost an unnecessary starch component given the rice and beans. I think I would have traded one of those sides for fajita-style grilled peppers and tomatoes for my tacos. The Tapias' daughter, who was helping with service, told me her father makes weekly trips to Chicago to buy all of his meat because he strives for the quality he finds there. That is not the kind of effort I expected at this little place, but an effort I truly appreciated. Some other great offerings that came to South Whitley from Chicago were the desserts. The huge slices of cake took me back to many diners of the past – the former Omega on Coliseum Boulevard, for one – that had those big, circulating dessert cases with decadent cakes and pies calling your name from the time you walked in. The coconut cake was my favorite, with a lot of coconut in its sweet white icing and a lot of coconut flavor throughout. But the chocolate was also pretty darn good, too. The banana cream pie had a tasty, thick custard and would have been better had I gotten a fresher slice, as the bananas had turned a bit too much. Another weekend feature – actually two of them – sounded too good not to try. Grilled tilapia or grilled shrimp with garlic sauce were offered. I wanted to try both and asked if I could do so, and my server was quick to approve my combo for a small upcharge. 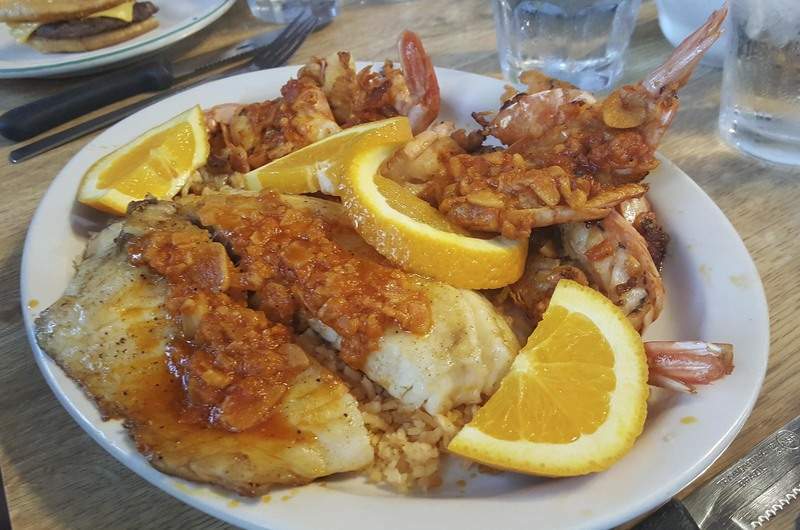 The fish was perfectly cooked – flaky and moist – and it and the butterflied, shell-on shrimp were covered with a zesty tomato-based sauce dotted with chopped onions and a ton of sliced garlic. The sauce was bright and acidic, and even though that garlic flavor was strong, it didn't linger. I loved it all and am not sure I could choose one over the other again. Good thing I won't have to. 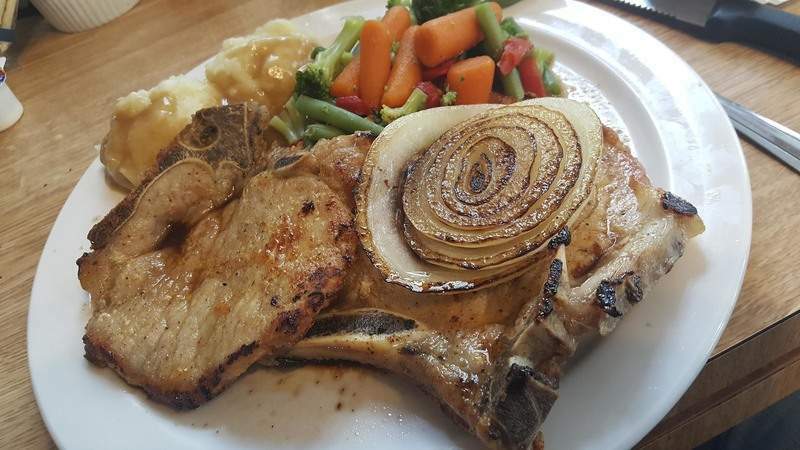 One of my favorite diner specialties – pork chops – was also a safe bet. My two thin chops had a nice, crispy fat edge, and the grilled onions on top – just like on the carne asada – were a perfect addition. The mashed potatoes on the side were perfect, though the gravy and the side of mixed veggies were mediocre at best. The only breakfast item I sampled was the Strawberry Delight waffle. 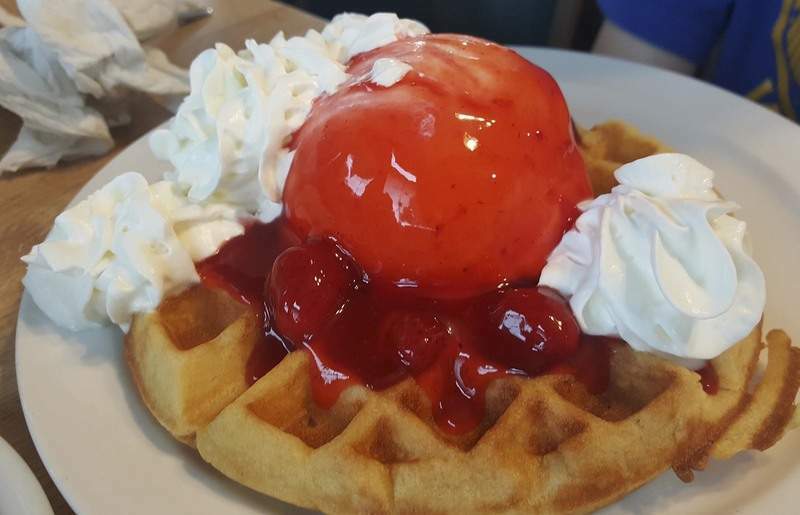 The waffle was flawless and the ice cream and whipped cream were fine, but the strawberries were not fresh, and there were not enough of them to “delight” me. The one dish that the Arnolds strongly pitched as “better than any Italian restaurant” did not quite live up to the hype, but was still decent. 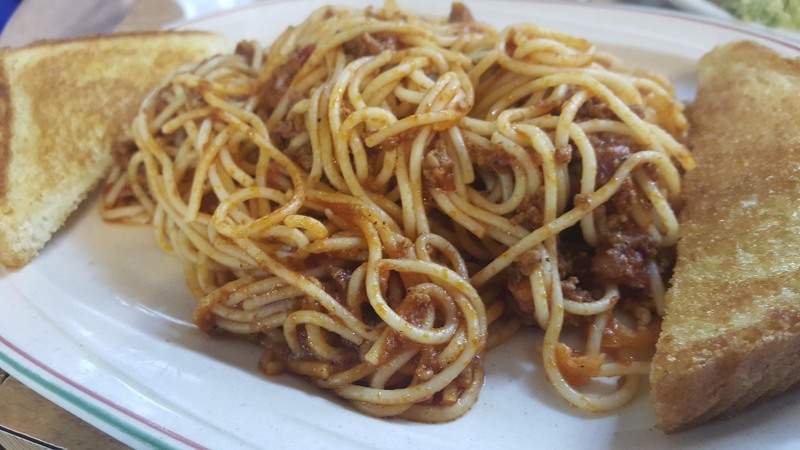 The spaghetti was pretty basic, with ground beef cooked in a sweet tomato sauce stirred into cooked pasta. It was a tasty version of the one-pot spaghetti pretty much every mom in my neighborhood whipped up for her hungry kids and their friends on a regular basis. But I would not put it up against most Italian restaurants. Aside from that guacamole, the appetizers were pretty mundane, but the Riverside Nachos were decent. 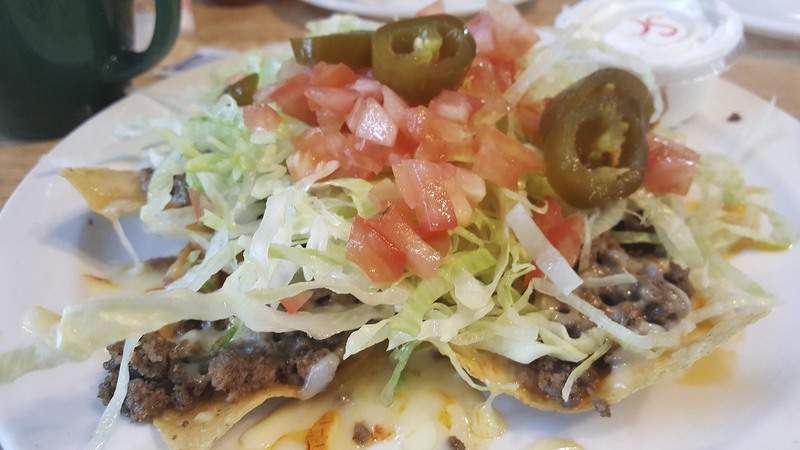 There was plenty of seasoned ground beef, lettuce, tomatoes, refried beans, sour cream and jalapenos (if you wanted), but the chips were a bit chewy instead of crisp – like the ones I received with my salsa – as if they spent time in the microwave. The only item I can say I would not eat again was the corn chowder, which came with the dinners. It tasted like someone just opened a can of creamed corn and heated it up – not even a good can, either, as it had zero flavor. The side salad was nothing special, but it was still way better than that soup. So was I glad I ventured over to South Whitley to try the Riverside Cafe? Absolutely. 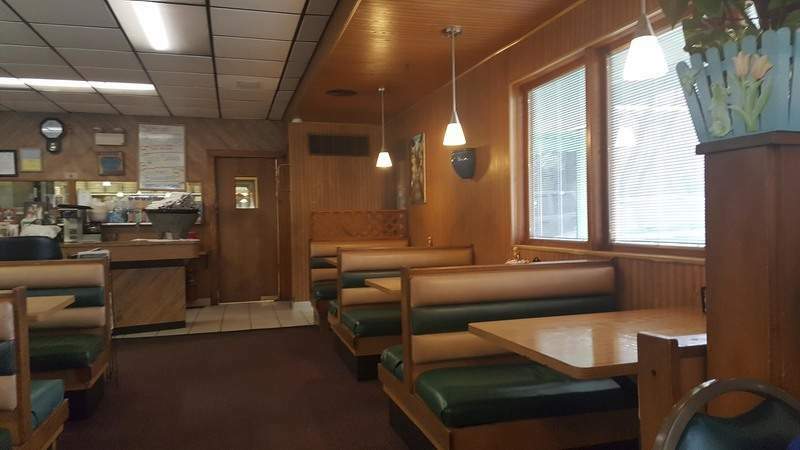 If I ever find myself over there again and need to grab a bite, I would gladly go again – if not for spaghetti, for that carne asada or fish special. And for the cake, of course. Ryan DuVall is a restaurant critic for The Journal Gazette. This review is based on two unannounced visits. The Journal Gazette pays for all meals. Email him at rduvall@jg.net; call at 461-8130. DuVall's past reviews can be found at www.journalgazette. net. You can follow him on Twitter @DiningOutDuVall.